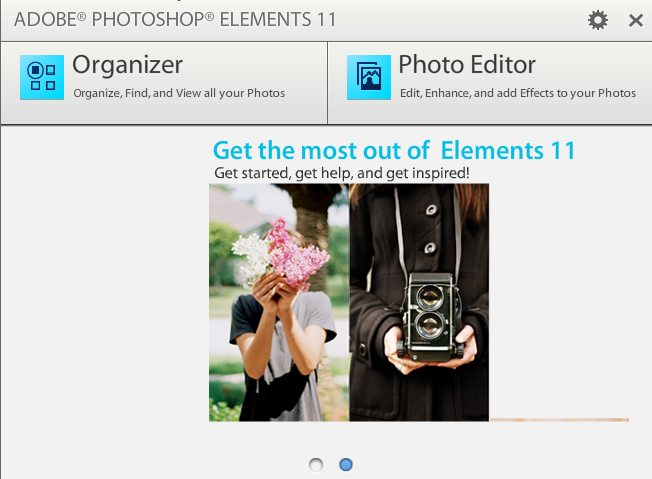 Should You Upgrade to Photoshop Elements 11? Since Photoshop Elements 11 (PSE 11) has been released I have posted videos overviewing the new look of the Organizer and the Editor. I also posted a video that described its new features. If you are currently using an older version of Elements, should you update to the new version? If you have never invested in Photoshop Elements is this the time to take the plunge? What follows is basically what I’ve been telling my students when asked. My thoughts have not changed much since learning that I will be teaching PSE 11 at the South Bay Adult School beginning in January. Upgrading to PSE 11 may not be for everyone. Also, if you decide to sit this upgrade out or upgrade to PSE 10 to stay with the classic look, you may find my ebook, Photoshop Elements: The Organizer to be a very useful reference. It’s available on Amazon for the iPad or Kindle Fire. If this is you, and you want to begin using Elements, buying PSE 11 is definitely the way to go. There is no doubt that this is the future direction of the program. Since Adobe put a lot of effort into the layout and workflows to make the program easier to use, you most likely will find coming up to speed easier than if you had purchased PSE 10 a year ago. Historically Adobe releases a new upgrade to Elements every fall. This has been their practice for the past many years. Unless you are like me, and strive to have the latest version of the prime programs you use frequently, my usual advice is to think about upgrading every couple of years. Generally, the added features and correction of existing bugs warrant spending another $80 or so. Converting your Catalog to a new version is basically automatic. You should have no problems, as long as your Catalog on the older version is in good shape with no photo disconnect issues etc. So if you are using PSE 10, you could skip this release and wait for PSE 12, but this time things are different. In previous years, to help people decide whether or not to upgrade to the very next version, my advice was to suggest that they review the new features to see if one or more of them was something they would really benefit from. Generally speaking, the older the version you are using, the more you will benefit from upgrading. For example, let’s assume that you are actively using PSE 6, and are comfortable with the program and what it does for you and have no desire or time to learn a new program. If that is you, I would upgrade now to PSE 10, before you can no longer find it in stores or from reparable dealers on the internet. In fact I would do this regardless of what version I was currently using, including PSE 9, if I did not want to go the new look and feel in PSE 11. If this is your case, you probably never became comfortable with it or spent the time to learn it. Maybe its user interface looked too complicated or your first efforts to use it were frustrating. You do not have much or invested in the program. In my opinion, if you still have a need to protect and keep track of all of those photos from your digital camera, upgrading to PSE 11 is a good move, regardless of what previous version of PSE you own. Again the new look and feel may be just what you need. This is certainly my situation. I have over 35K images and videos in my Catalog that I have imported over the past ten years or so. During that entire time, the look and the feel of the program was pretty much the same. Being a volunteer beta tester for Adobe, I had the opportunity to work with PSE 11 for the past many months as it evolved into what was finally released in October. Frankly coming up to speed was difficult for me. Old habits and workflows die hard. I converted my existing Catalog to PSE 11 a few months ago. I have had to do a lot of relearning, but the effort has been worth it. I still do not know how to take full advantage of every feature now included in the Organizer, but as I use it, I like it more and more. What really helped me come up to speed with the PSE 11’s Organizer was Adobe provided the appropriate capabilities that allow me to ease in to the new way of doing things. I took the plunge. This path may not b for you. That is a question only you can answer. Almost everything above focuses on the Organizer. But remember, PSE also consists of the Photo Editor mode as well. It too has undergone a major redesign and sports a new and presumably easier to use interface. However, I personally did not have much trouble adapting to the Editor in PSE 11. I had to look for buttons in different places and things of that nature, but the commands themselves and their dialogs pretty much stayed the same. I was able to concentrate on using its new features. So, I have told you what I think. Leave a comment, and let me know your thoughts regarding upgrading to PSE 11. Are you planning to do so? What version are you using now? Is it easier to use? How easy has it been to adapt to the new look? Also, if you found my comments helpful, let me know that too. So Ed, what’s your plan for updating?